The idea that the people of the Brooklyn-Queens waterfront (and especially those in Red Hook) deserve a streetcar or light rail line has been knocked around for decades, but no one has ever been able to convene sufficient political and financial capital to move the project forward. Recently, however, a variety of community groups, technocrats, and real estate developers assembled a non-profit called the Friends of the Brooklyn-Queens Connector, which last summer commissioned HR&A Advisors, a real estate consulting firm, to conduct a feasibility study. De Blasio spokesman Wiley Norvell said that the administration, which is apparently conducting its own analyses, had intended to discuss its preliminary findings at an event last Friday that was postponed when high winds knocked over a crane in TriBeCa. Norvell also emphasized that, while the administration appreciates the Friends’ streetcar advocacy, the city has its own interests and motivations in exploring this idea. 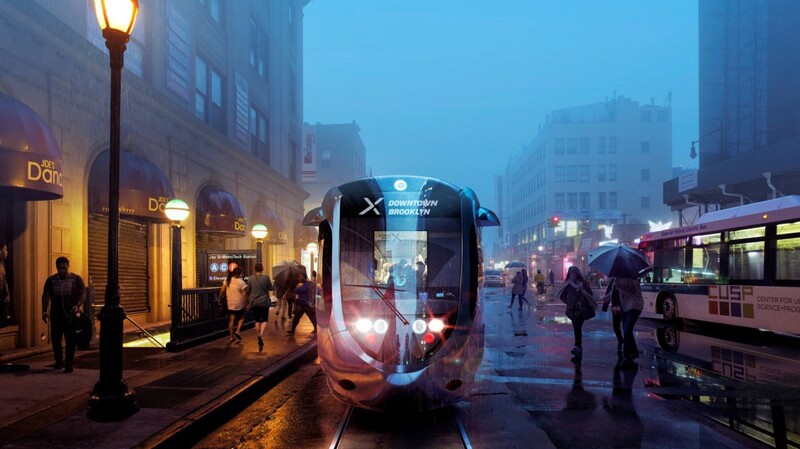 (It is worth noting that a large part of what makes building a streetcar system an appealing solution to transit issues for the administration is that it would not involve the state-run MTA, and therefore also would not involve Governor Andrew Cuomo.) 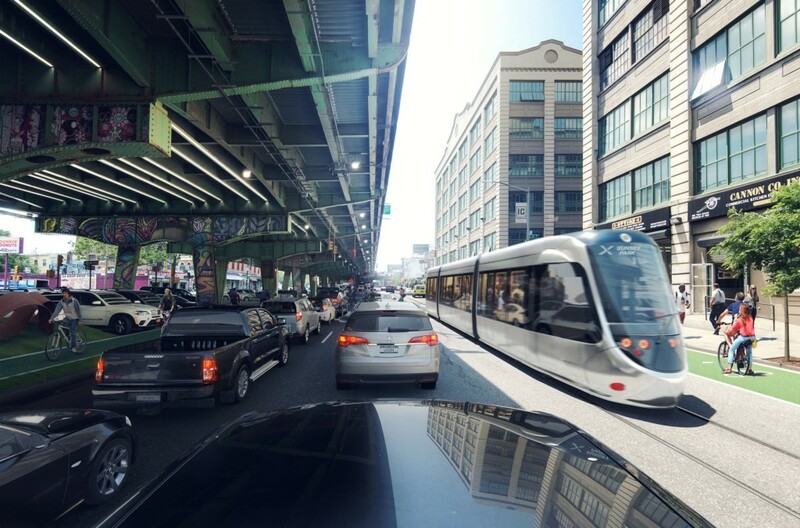 The BQX “aligns with our own public policy priorities in meeting the future needs of the city,” Norvell said. The city claims that more than forty thousand people living in thirteen nearby NYCHA developments would benefit from the proposed route. This may be so, but the proposal also implicitly ties the possibility of building any infrastructure that would help low-income New Yorkers to being simultaneously useful to rich people; the idea wasn’t considered viable until the people with money, who stand to make a great deal more, decided it would be worth pursuing. As recently as 2011, the city’s Department of Transportation decided it was not feasible to build a shorter streetcar line connecting Red Hook more readily to transit hubs in Downtown Brooklyn and DUMBO. It is perhaps worth considering, then, who the BQX’s newest supporters actually are. Earlier this month, the New York Daily News reported that it had “obtained” the study conducted by the Friends of the Brooklyn-Queens Connector, whose members include Doug Steiner, of Steiner Studios, a production company based in the Brooklyn Navy Yard; Fred Wilson, of Union Square Ventures, the venture capital firm; and Helena Durst, of the Durst real estate dynasty. According to the New York Times, the group also includes Jed Walentas of Two Trees Management. Neither paper makes their sourcing for this information explicit, and public information about the nonprofit is lacking. Charles Gergel, a partner in Manhattan law firm Cullen & Dykman’s banking department, is listed as an officer on corporate filings submitted to the New York Secretary of State last February. It registered last fall with the IRS as a public charity, but has not yet filed a tax return. Two different non-profit trackers list Andrew Steininger, senior vice president and chief of staff at the Brooklyn Chamber of Commerce, as a point of contact for the organization. (The nonprofit’s offices are listed at the same address as the chamber’s.) Neither Gergel nor Steininger returned interview requests. Rought told me that Friends was going to make their study available around noon on Wednesday this week, but that has come and gone, and there is still no study. Unlike Soho and Tribeca, where the classic city progression from decaying industrial buildings to artists’ lofts to condos for the superrich happened more or less organically, creating many fortunes along the way, Dumbo was the vision of one man. It was a planned community in the heart of Brooklyn, bohemia by the numbers. A self-described dictator, David organized everything, providing free rent to galleries, restaurants, and chic shops like Jacques Torres. And he defended his little enclave fiercely. “If you were with me, we were friends. And if you were against me, you were my enemy,” David tells me. His son Jed, who apprenticed under Donald Trump, is now a principal at the firm, and was responsible for brokering the Domino deal. In Williamsburg, Two Trees also developed the Wythe Hotel, and it owns thirteen residential and commercial buildings in DUMBO and Brooklyn Heights, all of which would benefit from the BQX’s existence. While, at first blush, one might find it surprising that local, community-oriented activist groups like Red Hook Initiative and Los Sures would ally themselves with ambient technocrats from Google and Union Square Ventures and ravenous developers like the Walentas and Durst families, there is also no denying practical realities: Red Hook desperately needs better transit options, and misery acquaints a man with strange bedfellows. As Friends only incorporated as a nonprofit last year, there is not yet a record of its finances; however, such a record does exist for some of its constituent members: In 2014, according to tax filings, the Red Hook Initiative received just under $1.8 million in grants and donations, and its net assets were just over $2 million. (Most of its money went towards programs for local high schoolers.) In 2013, Los Sures, or the Southside United Housing Development Corporation, took in $343,607 in grants and contributions, and its net assets were $5.3 million. (Los Sures preserves and develops low-income housing in South Williamsburg.) Union Square Ventures, meanwhile, manages $1 billion across six funds; Two Trees Management’s portfolio is worth some $4 billion; and Google’s market capitalization is $475 billion. What remains unclear, however, is why the people of Flatbush are less deserving of romance than those of “Silicon Alley.” (“Urban change,” for that matter, is an awfully ahistorical way to describe the vexed relationship between development and displacement.) Advocates speculate that tax revenue generated by new construction in Astoria stimulated by the streetcar line will pay for the whole project, but that probably sounds more like a threat to the people currently living in Astoria than a reassurance, and it hardly makes any difference to the people living in Flatbush who need better transportation options now, not a decade or more later.